Switching TO 35 exhaust from horizontal to vertical. 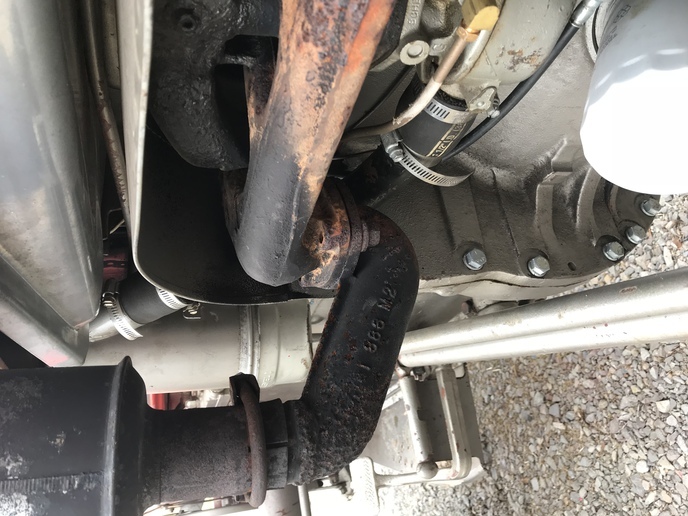 Posted: Thu Feb 01, 2018 4:19 pm Post subject: Switching TO 35 exhaust from horizontal to vertical. Has anyone changed their TO 35 Deluxe horizontal exhaust to a vertical exhaust? 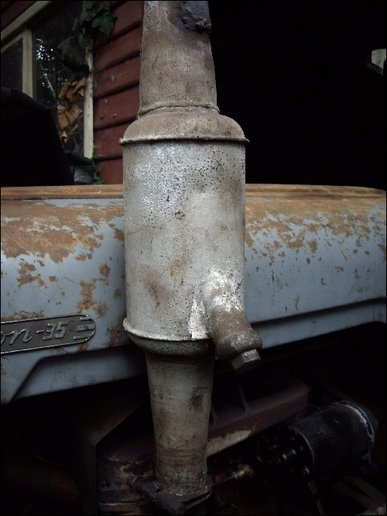 I spoke to Dave at Yesterday's Tractor and he said to use manifold elbow 181886M2 and vertical muffler S43644. Dave also said the diameter of the muffler is 4 1/2 inches. My question is will this exhaust assembly clear the tractor body and not lean against my original Ferguson Deluxe decal? 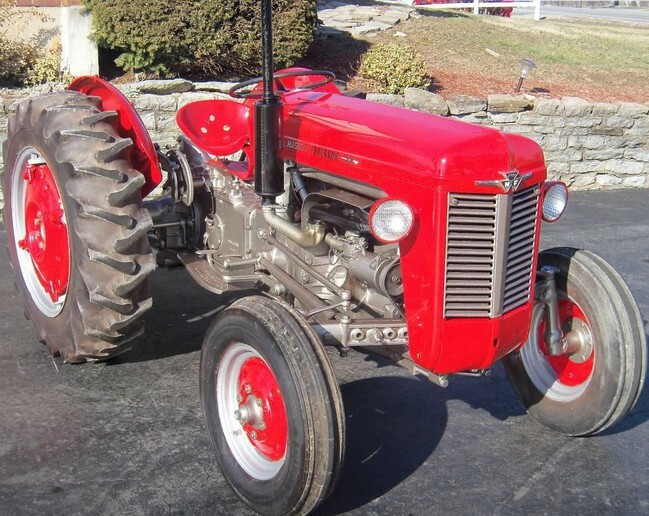 I have the Continental engine and the tractor is a 1958 model. Thanks in advance for any help. Posted: Fri Feb 02, 2018 12:42 pm Post subject: Re: Switching TO 35 exhaust from horizontal to vertical. Over 50 reads and no replies. I cannot speak with absolute certainty, but I have two TEA's, one with a vertical exhaust and the muffler clears the hood okay. When the hood is part way up, there is some sway. So, you might have to guide it up and down a little. Posted: Fri Feb 02, 2018 3:37 pm Post subject: Re: Switching TO 35 exhaust from horizontal to vertical. (quoted from post at 17:19:06 02/01/1 Has anyone changed their TO 35 Deluxe horizontal exhaust to a vertical exhaust? I spoke to Dave at Yesterday's Tractor and he said to use manifold elbow 181886M2 and vertical muffler S43644. Dave also said the diameter of the muffler is 4 1/2 inches. My question is will this exhaust assembly clear the tractor body and not lean against my original Ferguson Deluxe decal? 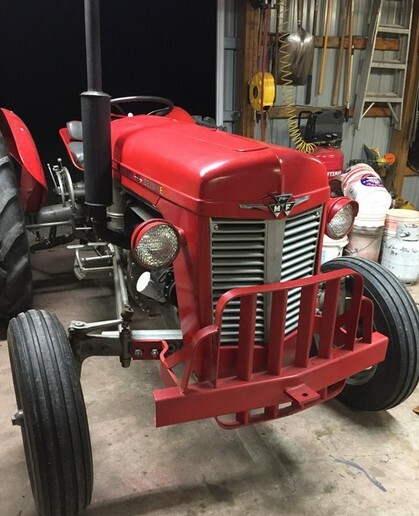 I have the Continental engine and the tractor is a 1958 model. Thanks in advance for any help. 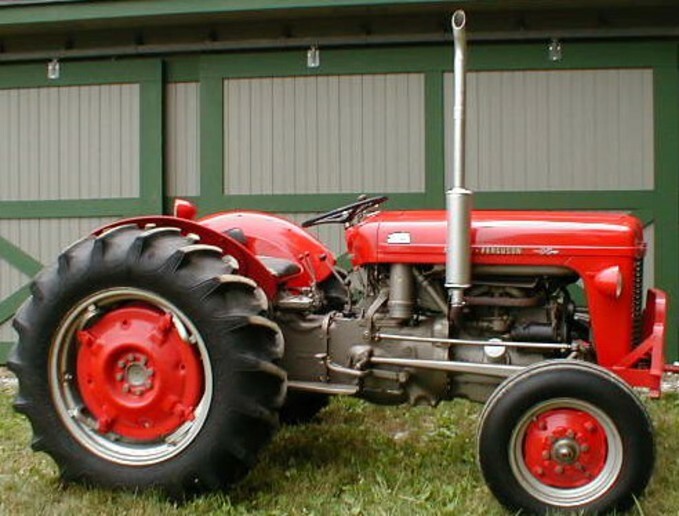 I have a 1963 MF 35 Deluxe with the z134 and a vertical exhaust. I will try to post some pics this weekend of the clearance it has with the hood. There is not much. Posted: Fri Feb 02, 2018 4:12 pm Post subject: Re: Switching TO 35 exhaust from horizontal to vertical. Thanks. I wait for the pics. Much appreciated. Posted: Fri Feb 02, 2018 6:16 pm Post subject: Re: Switching TO 35 exhaust from horizontal to vertical. deluxe but it has a horizontal exhaust. Posted: Sat Feb 03, 2018 7:02 am Post subject: Re: Switching TO 35 exhaust from horizontal to vertical. Wow, thanks for the pics. That really helps. 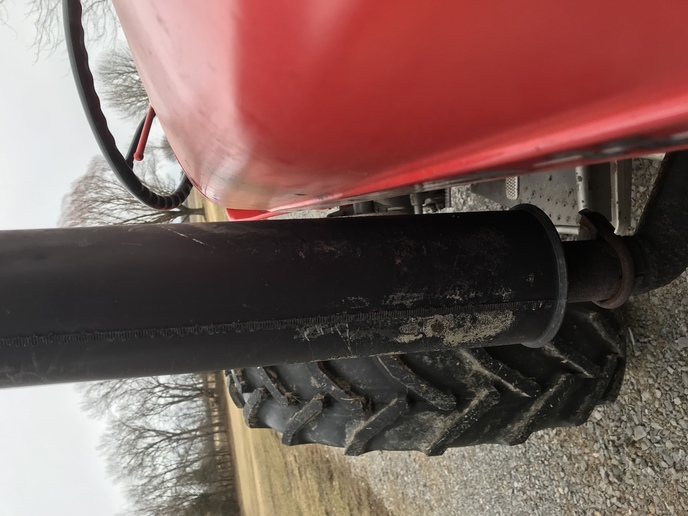 Posted: Sat Feb 03, 2018 12:12 pm Post subject: Re: Switching TO 35 exhaust from horizontal to vertical. Posted: Sat Feb 03, 2018 2:08 pm Post subject: Re: Switching TO 35 exhaust from horizontal to vertical. Posted: Sat Feb 03, 2018 2:17 pm Post subject: Re: Switching TO 35 exhaust from horizontal to vertical. Thank you for the photos. That really gives me a good visual. I think the elbow you have is the same as the one I'm looking at on YT. Another person posted about exhaust in the face with this set-up. Is that a problem for you? My greatest concern is starting a fire with the horizontal exhaust. Fire danger is high here and I need to clear some rabbit brush. Thanks again for the help. Posted: Sat Feb 03, 2018 2:51 pm Post subject: Re: Switching TO 35 exhaust from horizontal to vertical. Posted: Sat Feb 03, 2018 2:55 pm Post subject: Re: Switching TO 35 exhaust from horizontal to vertical. I have a TO30 with horizontal exhaust and have used it to mow and bush hog for the last 20 years. Haven’t started a fire yet, but I guess the chance is always there. Just bought this MF35 with the vertical exhaust in October and it needed some work so I have not really used it much. The horizontal is definitely quieter. I can’t complain or endorse the vertical until I use it more. Posted: Sat Feb 03, 2018 3:09 pm Post subject: Re: Switching TO 35 exhaust from horizontal to vertical. The Australian made spark arresting muffler fitted to my FE35 Grey and Gold has made a mess of the bonnet and emblem . 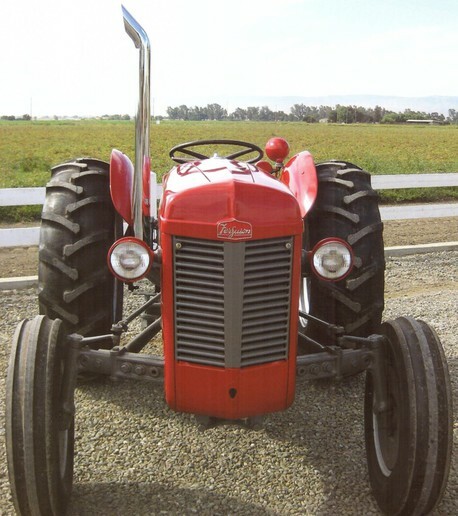 The problem occurs due to wobble in the front pivot joints , some tractors' bonnets wobble more than others . You can play around by packing the joint on the rhs with washers to give slightly greater clearance on that side . Posted: Sat Feb 03, 2018 7:20 pm Post subject: Re: Switching TO 35 exhaust from horizontal to vertical. Posted: Sun Feb 04, 2018 3:07 am Post subject: Re: Switching TO 35 exhaust from horizontal to vertical. I have one of each. The biggest disadvantage of the horizontal exhaust is having to stop and start the engine to hook up an implement. The exhaust is right in your face. Posted: Sun Feb 04, 2018 6:59 am Post subject: Re: Switching TO 35 exhaust from horizontal to vertical.